Welcome to the overdue update on Conquest of the Gods! 2016 has had a somewhat chaotic start for me in my personal life, and as they say life can get in the way. However I am happy to report that progress has been made and things are moving forwards (just not as quickly as planned). 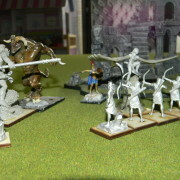 Norse: All models have been sculpted, book art work has been finalised and these are now finished! Nothing new here to show off but I can advise that Thors rules have been given a tweak thanks to some very helpful playtesting feedback. Egyptians: All models have been sculpted, I am re-sculpting one of the models, adding another unit to the range. The need to add another sculpt came out of play testing and is almost finished. One more piece of artwork needs to be done and then this section of the book is also finished – this should all be sorted by the end of April. Dan Mitchell has been doing a great job in finishing up this part of the book, here is the recently completed artwork for the Alpha Sphinx. Greeks: Final unit has been sculpted and I am waiting on the final files for the unit to arrive and then they all sculpted. 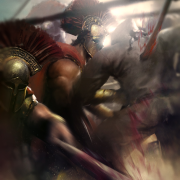 I am going back and making a minor edit to the hoplite miniatures as im not happy with their Doru (long spears), they tend to bend too much when being transported – another small edit ill make thanks to playtesting. The talented George Evangelista has started the final illustration for Greek section of the book. I expect that the Greeks will be off my list by the end of April. 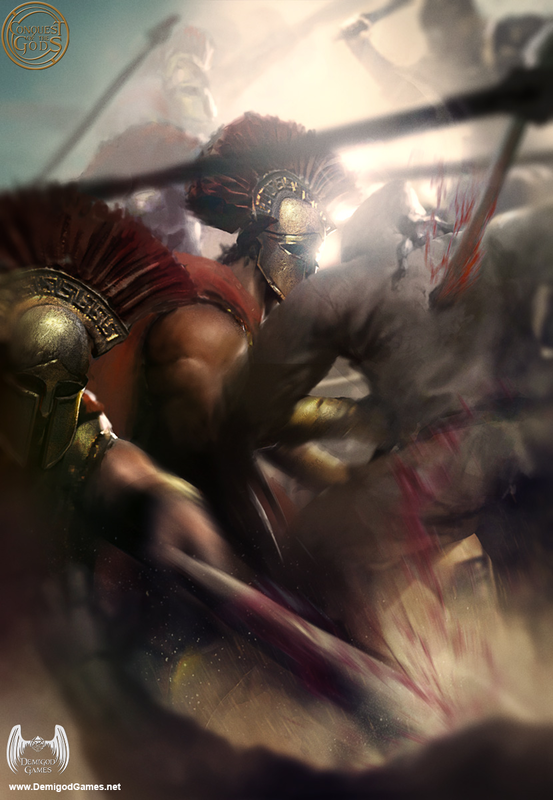 George has finished a few pieces recently; here is the last one he completed – the mighty Spartans. 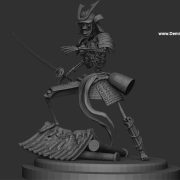 One of the reasons the art work takes a while is that I don’t commission each piece until after we have sculpted the miniature, this is to ensure that the artwork matches the sculpt. This has been an ongoing bugbear of mine with other games for years, so its important to me that when you look at the artwork in the book it aligns with what we have produced in the miniatures range. I also found time to re-review the books fiction and found two small plot holes that I had to fix, this allowed me to write a new combat scene between two of the gods that I am going to have someone proof read for me before I insert it into the book. Once the above mentioned artwork is finished I can finally move on to having the final quotes and proofs for the book printing done. I will be also looking to do a digital release of the book, and will confirm details on this once I have signed the book off as finished. On to the miniatures production. I have sourced a vulcaniser and plan to pick it up soon – I have been chasing this machine up for the better part of a year now but am assured it will be ready in a few weeks. Once I have picked it up, I will look forward to sharing some pictures with you all. I will also be importing a spin casting machine, allowing me to cast all of the metal miniatures in-house, in turn, this will help me sell them at a more competitive price. I had planned to be sharing news on the vulcaniser in this update but unfortunately, it will have to wait for a future update. I have some 3D prototyping to do, and will be focusing my efforts on that in the coming months as I start to get my in-house moulding up and running. For those interested, here is a couple of pictures from one of the recent play testing sessions, please excuse the unpainted models, these are play test models and have been broken, dropped and some have been used for testing paint scheme ideas. For those of you who are not interested in game design, this next bit may be quite a bore to read. 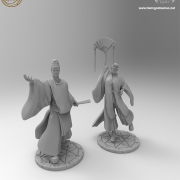 I am also in the middle of re-designing the points cost system for the miniatures and I thought I would share my thoughts on this rather complex process. There has been an ongoing debate within the game design circles around model points systems and if they really bring about game balance. 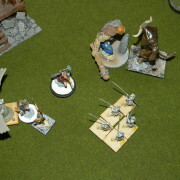 The basic premise of model points costs is that each model is worth a certain number of points, this, in turn, helps balance the power of models against one another as most games are limited to a specific number of points – for example, you take 1000 points worth of models, more powerful models are worth more points. The major player in the industry recently launched a new (ok, recycled might be a better term here) game system that controversially did away with the traditional points system, seeking to find game balance in other ways. The major issue with points systems is that the formulas used to create them can be somewhat subjective and ultimately the game designer makes those subjective decisions. So we are left with an imperfect formula, made by imperfect human designers that often result in what gamers call power creep, where newer models are more powerful as the systems used to design them evolve with the designers understanding of what they can get away with through the rigors of playtesting. To try and future proof conquest of the gods I have created a horribly complex formula that includes variables from the next 3 planned expansion books – will this result in a perfectly balanced game? I’d be lying if I said yes, but I think it will be better balanced than some of the other systems out there. After all I still have to subjectively start with what 1 point is worth and make subjective assumptions about some of the specific model rules, but I am playtesting the new system with a lot of rigor to bring you something that has some degree of in game balance. I would be interested to hear people’s thoughts on model points systems and what factors they like and find frustrating about them. That’s it for this update. We are inching closer and closer to an actual release! I have had a few stockists contact me who are keen to support the game, so I am pushing hard to get the in house casting up and running ASAP!